I’m in Houston, my first stop on a four-city, two-week book tour about And God Said. (Read more.) Sponsored by the JBC, the tour brings me to Houston, San Diego, Milwaukee, and Boulder this month, in addition to Queens (last month) and Wilmette, IL (in March). Those who are so inclined can follow along from the book’s blog. 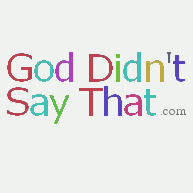 I want to keep “God Didn’t Say That” as commercial-free as possible, so I’ve set up a separate blog for the book here, though the book is about Bible translation, so I’m sure there will be considerable overlap.